Tag Archives: HTTP to HTTPS: Are You Set For The Switch? 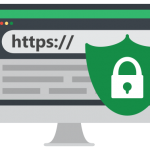 HTTP to HTTPS: Are You Set For The Switch? December 17, 2017	Comments Off on HTTP to HTTPS: Are You Set For The Switch?